Unique and patriotic handkerchief gift set featuring the RAF Roundel emblem. 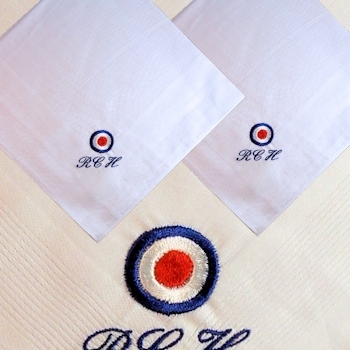 A pair of two cotton handkerchiefs personalised with a name or initials of your choice and featuring the Royal Airforce Roundel embroidery motif. This useful gift set has two embroidered cotton hankies, and personalised with a name or initials in a thread colour of your choice.